Several of the participants in Cafe Ole's 5k run or walk are told about the route just minutes before they were on their way. Cafe Ole drew 36 runners to its first 5k run or walk through Cooper-Young on Friday, September 28, raising $2,000 for Ronald McDonald House of Memphis. Organizers were hoping to attract 100 participants, but only had 36 that registered for this event. Despite that lower than expected number, however, Cafe Ole did collect $2,000 from registration fees and business sponsorships, which Johnson said will all go to the Ronald McDonald House. More will come from other Wifflestock events like the "Pun Baby" poker tournament, which Cafe Ole hosted. For Shannon Williams, 39, of Memphis it was his first attempt at doing a 5k run. The motivation to do this came from, he said, "friends and the desire to prove that I could complete it in a respectable time following ACL (Anterior Cruciate Ligament) replacement surgery." The ACL is one of four major ligaments in the knee and one that Williams damaged in a cycling accident last October. Even though Williams had some concern and apprehension about possibly re-injuring his knee during the run, he said that it did not hurt him afterwards. "I enjoyed it a lot and I will definitely do another one," Williams said. The 5k was also a first for Janet Phillippi, 51, of Memphis. Phillippi said that she wanted to do the run so that she would see how prepared she was for a half marathon that she intends to run for St. Jude on December 1st. The idea for organizing the Cafe Ole 5k run, according to manager Denise Johnson, was to combine it with the Wifflestock tournament on September 29th and 30th. "We participated in the Wifflestock tournament last year at Tiger Lane," she said, and "we had an amazing time helping out for a great cause." Because of last year's experience, Johnson said Cafe Ole decided to sponsor the 5k run this year "to try to do something extra for Ronald McDonald House charities of Memphis." Overall, Johnson indicated that she was pleased with the turnout and she said that Cafe Ole "will definitely do it again next year and make the necessary changes to make it even bigger and better." 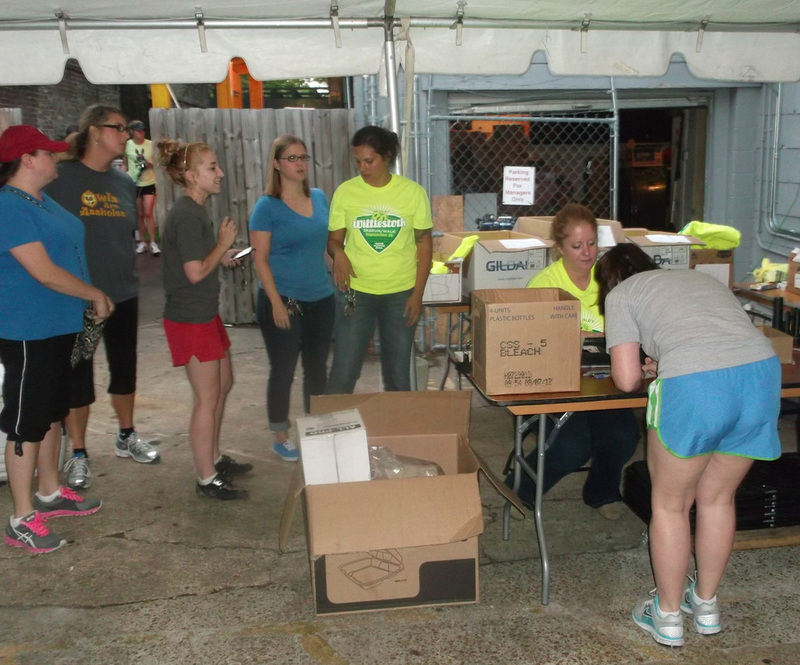 Cafe Ole employees, in the yellow t-shirts, register one of 36 participants in Cafe Ole's first 5k run to benefit the Ronald McDonald House of Memphis.